The car which is going on the road with the exclusive WWW1 plate number has been revealed with motoring blog Paultan.org putting up the photo of Sultan Johor and a new Proton Satria Neo in orange at their Facebook page. The WWW1 plate number gained huge publicity after the Department of Road and Transport (JPJ) revealed that it was bought by royalty at a staggering RM520,000 bid. 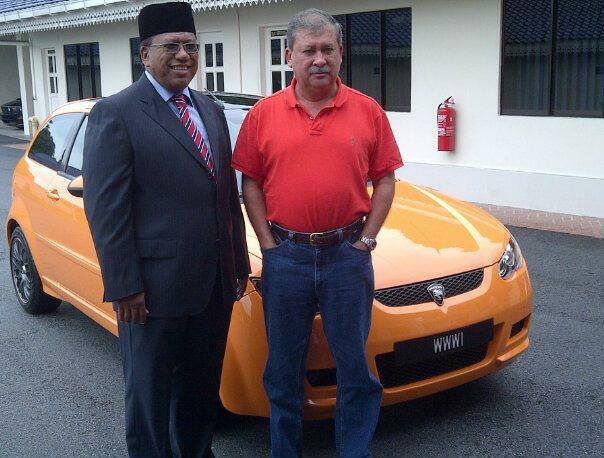 Pictured is the Sultan with Datuk Razak Dawood from Proton Motorsports obtained from Paultan.org Facebook.